You’ve been considering adding a deck to your Baltimore home for quite some time. Why not? With an average return on investment (ROI) of 87%, according to Remodeling Magazine’s annual Cost vs. Value Report, decking is a great investment. The only problem: you don’t want to deal with the annual maintenance. It the words of Sweet Brown, “Ain’t nobody got time for that!” Fortunately there is a simple solution: a Composite Deck. Pressure-treated lumber was once the greatest thing to hit the decking industry since…well, decks themselves. This new style of lumber was more durable, able to hold up to weathering much better than untreated lumber. Still, pressure-treated boards require annual stripping, sanding and staining. Yikes! Fast forward nearly half a century and composite decks are taking the industry by storm. Goodbye stripping, sanding and staining. And good riddance! Made of a mix of waste wood or cellulose fiber and plastic, composite decking requires only occasional cleaning. Just grab a hose and give it a quick rinse. Voila! You’re done. What could be easier? Composite decks gained a great deal of popularity over the past decade with homeowners who wanted great looking decks without having to worry about waterproofing them every few years. Composite decks stand up to weather – from blazing summer sun to icy snow – without fading, cracking, or warping. Call Freedom Fence and Home! 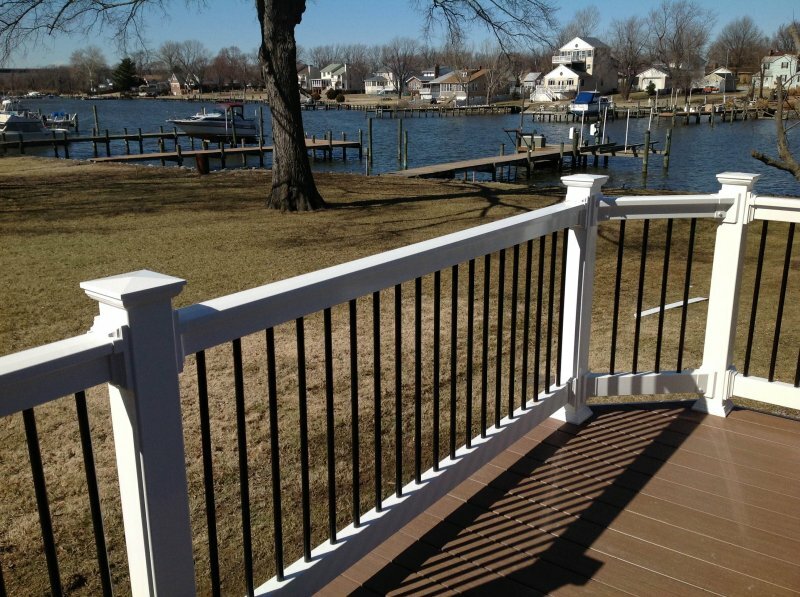 Located in Northern Baltimore County, Freedom Fence has been installing composite decks for years. We are extremely familiar with the different composite deck materials available, and our crews have used these materials to build single level and multi-level decks throughout Baltimore and Harford counties. Freedom Fence and Home can also handle other projects, including the installation of deck lights, railings, and fences on your property. If you have any questions about adding a Composite Deck to your Baltimore home, please contact Freedom Fence and Home by calling 443-271-6841 or visit our website. You can also follow us on Facebook and Twitter! This entry was posted on Wednesday, August 6th, 2014	at 1:12 pm	. Both comments and pings are currently closed.